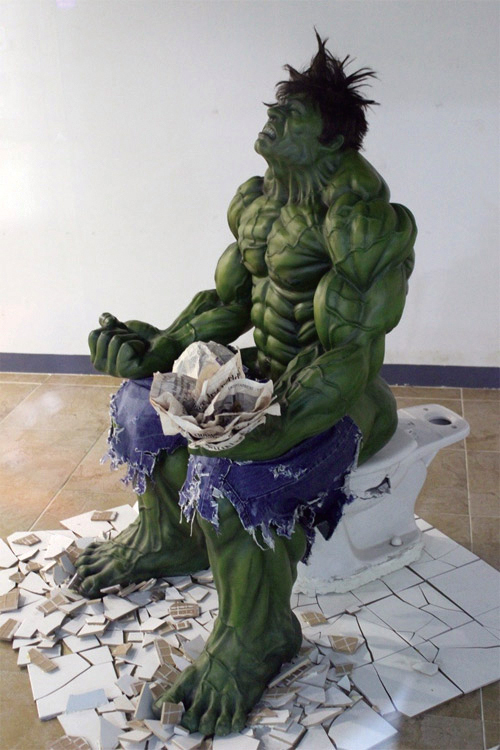 At one point or another we've all made or heard a joke about The Incredible Hulk looking constipated, but none of us have actually made a sculpture out of the Green Goliath relieving the tension - until now. Spotted in Seoul, Korea by the folks at Obvious Winner the detail used in the 'Hulk Puuuussshhhh!' sculpture is deadly serious - even if it's subject matter is not. Probably having just read how DC locked Marvel out of the January Top 10 in that bit of on the job reading material, news of the clean sweep obviously just doesn't flush for ol' Banner.